The latest smartphone sales data from Kantar Worldpanel ComTech, for the three months to October 2014, shows that the iPhone 6 launch has sent Apple’s share of British smartphone sales up 10.4 percentage points. Apple now accounts for 39.5% of British sales, its highest ever level. Across Europe*, Android sales still lead at 69.4% despite falling 2.5 percentage points. Apple’s iOS is up 5.7 percentage points to 20.7% thanks to the iPhone 6; Windows stands in third with 8.7% of the market. Early adopters of the iPhone 6 in Great Britain are typically 16-24 year olds (34% of sales) and male (64%). The top reasons shoppers gave for choosing the iPhone 6 were 4G capability (51%), screen size (49%) and design (45%). Every time Apple releases a new iPhone the share of sales made through its own stores significantly increases, and this occasion was no different. Almost a third (31%) of iPhone 6 sales in Great Britain were sold directly through Apple’s retail offer. The iPhone 6 outsold the 6 Plus by a 4:1 ratio. In the US, Apple sales rose by a more modest 0.7% in the three months ending October 2014 versus the same period a year ago. Verizon (42.2%) and AT&T (41.4%) took an almost equal share of iPhone 6 sales, but AT&T held an impressive 63% share of iPhone 6 Plus sales, showing that it was being favoured on larger screen devices. The iPhone 6 outsold the iPhone 6 Plus by a 3:1 ratio, with 6 Plus buyers tending to be older than iPhone 6 buyers. 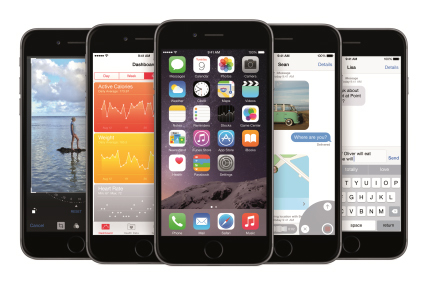 Overall, iPhones made up four out of the five best-selling models over the past three months. In China, Apple’s share grew by 0.2 percentage points to 15.7% in the three months ending October, growth driven by the success of the iPhone 6. Both the iPhone 6 and 6 Plus became available in China on October 17 and, despite the short availability, the iPhone 6 was the third best selling device in October. However, it is local brand Xiaomi that continues to dominate. Its Xiaomi RedMi Note ‘phablet’ was the top selling model in October, bringing Xiaomi’s share of the market to 29.9% over the past three months.